Oakhurst resident Conan Cocallas took pictures this morning outside his home in Oakhurst of a deer in distress. Cocallas said the deer looked like an adolescent and seemed to be in distress. His neighbor called him and told him that the deer was outside his home, so he went outside and took pictures. Cocallas says that other neighbors have spotted the deer in the area since last Friday. Fish and Game is aware and has been driving around the area searching for the deer. Cocallas says that the collar appears to be plastic, and he was told by neighbors it might be a piece from a chicken feeder. 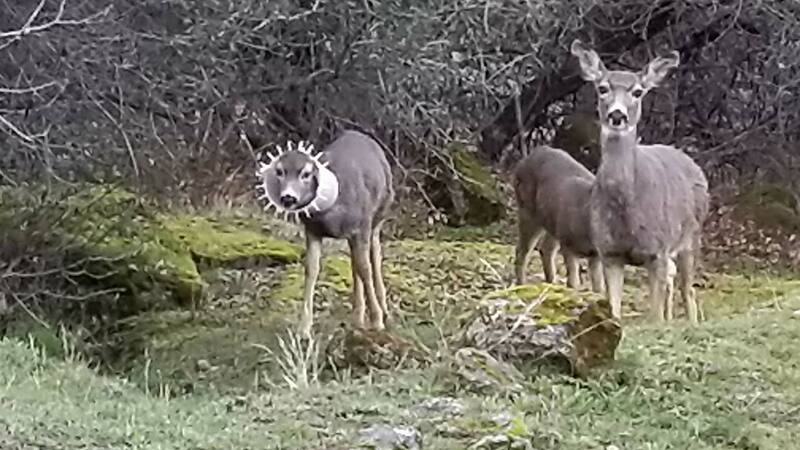 Cocallas says that witnessing deer near his homes happens quite frequently, but today's sighting was unusual.